Designed for intense and fast tanning. Non-greasy and leaves the skin soft and hydrated. 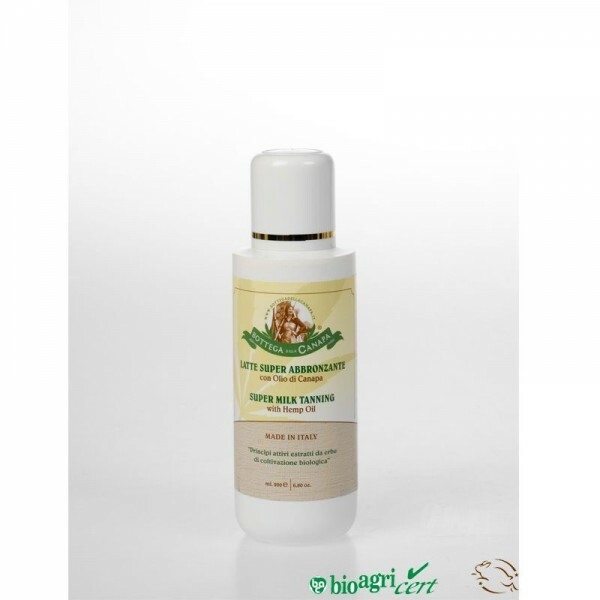 Wonderful synergy of oils, enclosed in a very light emulsion: the presence of almond, jojoba, avocado, hemp and sunflower oils makes it nourishing, slightly protective. Vitamin A of carrot oil counteracts sun exposure damage. Reserved for those who already have a tanning base and do not need sunscreen, recommended only for dark / very dark skin, already tanned in a consistent way. It does not contain synthetic sunscreens. Warning: excessive exposure to the sun is a serious risk to health. This product does not contain sunscreens and does not provide any protection against damage caused by the sun. Apply with light massage on the whole body. Use for short periods, it is recommended to use it together with sunscreen products. AQUA, PRUNUS AMYGDALUS DULCIS SEED OIL, BUTYROSPERMUM PARKII SEED BUTTER, PERSEA GRATISSIMA SEED OIL, SIMMONDSIA CHINENSIS SEED OIL, GLYCERYL STEARATE, CETEARYL ALCOHOL, STEARIC ACID, SODIUM LAUROYL GLUTAMATE, CANNABIS SATIVA SEED OIL, CETYL ALCOHOL, HELIANTHUS ANNUUS SEED OIL, BENZYL ALCOHOL, SALICYLIC ACID, GLYCERIN, SORBIC ACID, DAUCUS CAROTA (root) EXTRACT, PARFUM. The line of natural cosmetic products BOTTEGA DELLA CANAPA® has been designed to meet all the needs of beauty and health of the skin of the face, body and hair, taking advantage of all the best synergies of active ingredients combined with the wonderful qualities of the oil hemp seeds. This oil, dark green, odorous and rich in chlorophyll, contains high amounts of essential fatty acids (Omega-3 and Omega-6 in 1: 3 ratio) in the ideal proportion required for optimal human cell growth and for a correct hormonal balance. In particular, the presence of linoleic acid (LA), alpha-linolenic acid (LNA) and rare gamma linolenic acid (GLA) and their marked anti-inflammatory and regenerating properties, helps to treat and prevent skin diseases such as eczema, psoriasis, to mitigate skin irritations and to prevent or reduce scar formation. Soothing and rebalancing, it is also an oil rich in vitamin E, which fights free radicals responsible for premature aging, and B vitamins (in particular B1, B2, B6). Cosmetic products with hemp oil have proved to be excellent for rehydrating thoroughly, giving elasticity to skin prone to dryness and chapping. They also nourish and protect hair, gently cleanse without attacking and keep them healthy and vigorous, giving them shine and softness. All the oils are packaged in particular aluminum dispensers to maintain unaltered all the active ingredients present in essential oils. Since 2007 we have created a complete certified line of natural cosmetics and hand-made soaps based on hemp oil. Our products, recognizable by the BOTTEGA DELLA CANAPA® brand, are of high quality and efficacy and are produced following two fundamental principles: ethics and ecology. In fact, we use ingredients and production processes that respect and protect human health and the environment, avoiding the use of raw materials that are harmful and aggressive, irritating, allergenic and of petrochemical or animal origin. Our wide range of natural cosmetics is certified BioAgricert, in addition the products are not tested on animals.